There’s something about superbike racing that is always exciting. Whether it’s seeing the field scramble to overtake and gain position or the pure sensation of speed; there is always something to watch out for. A rider leaning into corners left and right, trying to keep balance and gain just enough speed to swerve around and overtake that one bike out in front is just an amazing thing to see. You see, few games have the skill to emulate that type of excitement in video game form. Sure, there’s the MotoGP series and such these days, but back in the day, there weren’t too many superbike games that weren’t a copy and paste job of Super Hang-On or another first-person simulation … except for one. When I think of early superbike games that can actually provide the excitement of a circuit race, only one comes to mind – GP Rider. SEGA had luck with motorcycle games in the past (Hang-On, Super Hang-On and Racing Hero, to name a few) but this is easily one of the best they’ve made. So get on your helmet, and “hang on” because this week’s Forgotten Racers of SEGA’s Past is all about the classic GP Rider! 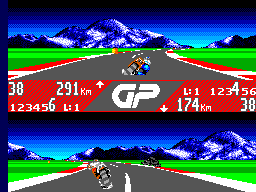 Released in arcades in 1990 for the SEGA X Board, developed by SEGA R&D 8 (the team that worked on Power Drift/G-LOC Air Battle), GP Rider was SEGA’s first motorcycle circuit racer. 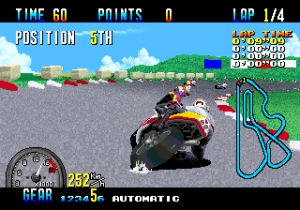 In the arcades, most bike racers were checkpoint based, similar to Hang-On. 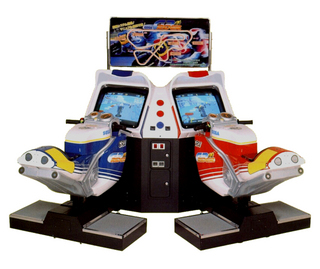 However, GP Rider was one of the first, with the exception Taito’s World Grand Prix, which came out a year earlier. I guess SEGA either wanted to show up Taito or try the genre out for itself. Whatever their purpose for it was, GP Rider is a damn fine racer and perfectly capable of capturing the true excitement of circuit racing. Being an early circuit racer, GP Rider’s premise is very simple – race four laps on a course packed with about 15 to 20 riders and hopefully take first place. 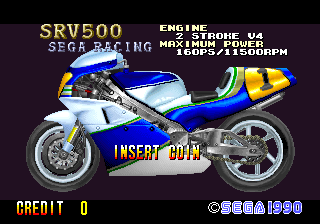 This was also one of SEGA’s first games to incorporate transmission selection, which would be a standard in most SEGA racing games from henceforth. As simple as the gameplay might seem, easy it is not. GP Rider has a significant learning curve that is apparent once you start playing. Once you get the hang of it though, the game is a blast. 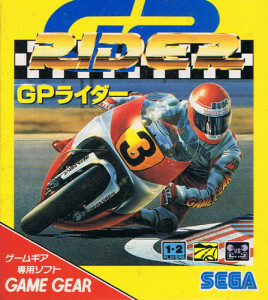 Compared to games of the same sub-genre (Suzuka 8 Hours, WGP), GP Rider is easily the most fun out of them all. Coming into arcades, multiplayer was one of GP Rider’s key points, considering all the cabinets came in Twin format. There were no single cabinets, even on the uprights, so every machine begged for two players to go at it. The AI in GP Rider actually provides some close competition. The back of the pack is slow at first, but they can keep up. There is a lot of overtaking and passing here, which adds to the hectic racing action. A circuit racer wouldn’t be fun if you stayed in the same position for the entire race. Graphics-wise, GP Rider looks damn good for when it was released. The style of the road design, not unlike Rad Mobile, Power Drift, and F1 Exhaust Note, is a little more polished, and the bike sprites are well done well and detailed. The bikes take up a good majority of the screen area but don’t detract from the the backgrounds and roadside objects, which look look pretty good in their own right. It’s easy to see that SEGA really got the look down of early ’80s and ’90s superbike racing. Another great aspect of GP Rider was its audio. The sound design, at times, sounds like it was recorded from real races. The engine sounds were done very well, as are the other sound effects. From what it sounds like, the announcer from Power Drift was used in this game too. GP Rider’s music was damn good too, with the theme that plays when using Automatic Transmission (Time Attack) being one of my favorite of SEGA’s best racing themes. The soundtrack altogether is one that’s worth listening to considering both Hiro and Takenobu Mitsuyoshi worked on it. Oddly enough, GP Rider did get home ports, on both the Master System and Game Gear, with the Master System version being the worse of the two. It’s pretty much a glitchy version of the original Top Gear with bikes that run very slow. It seems promising but is just boring after the first couple of minutes. The Game Gear version on the other hand, is a lot better. 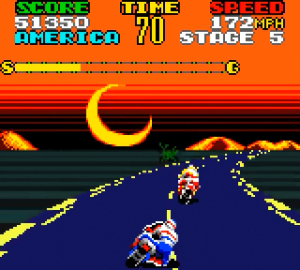 Your arcade, grand prix and basic modes are available, but GP Rider had another extra mode called World Tour, which is basically Super Hang-On but without music. In fact, the Game Gear port plays a lot like Super Hang-On, but it works for a portable version of GP Rider. All in all, GP Rider is awesome. Whether it be the arcade powerhouse or the Game Gear version, it’s definitely worth a play. GP Rider actually captures the feel of superbike racing and makes it a blast to play. Hell, throw in the multiplayer races and you definitely have some fun ahead! Thanks guys, for taking a look with me at GP Rider, which was one of the SEGA racers I used to play at a lot of arcades as a kid. As per usual, make sure to leave your feedback in the comments below. If there is any idea of a SEGA released racing game or a racing game on a SEGA console you’d like to be featured in a future Forgotten Racers, you can always comment or reach me on my Twitter handle, @Kusanagi765. Have a great day, and I’ll see you all out on the track!